The City of Atlanta sits upon the Eastern Continental Divide, with the headwaters of several major rivers located within highly urbanized sections of the downtown area. Proctor Creek flows westward to the Chattahoochee River; and Intrenchment Creek flows southeast to the South River. 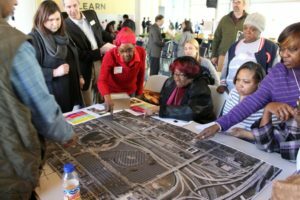 Both watersheds are home to sports centers like the Mercedes Benz and Georgia State (formerly Turner Field) stadiums, each surrounded by acres of impermeable parking areas and nestled in the predominantly African American, low-income communities of Vine City, English Avenue and Peoplestown. These are among the city’s most impacted watersheds, experiencing challenges of inequity, poor water quality, and frequent illegal dumping. Because of development in these compact urban areas, the neighborhoods also experience stormwater flooding during rainfall events. To combat the known problem of stormwater flooding, Atlanta has become a leader in green infrastructure. In 2015, more than four miles of permeable pavers were installed in the southeastern part of the city. At the time, it was the largest permeable paver project in North America. Several more projects were implemented in 2016; and, the Green Infrastructure Strategic Action Plan was approved in 2017 to integrate green infrastructure in city development and to monitor projects citywide. New construction in both the Proctor and Intrenchment Creek watersheds, however, continues to threaten vulnerable communities by increasing impermeable surfaces that perpetuate stormwater runoff and water quality issues. The headwaters of Proctor Creek and Intrenchment Creek begin in downtown Atlanta and flow through heavily urbanized areas and several prominent neighborhoods. In 2015, ECO-Action was awarded an EPA Urban Waters Small Grant to integrate green infrastructure concepts into the Atlanta University Center Historically Black Colleges and Universities system. Results of the project included coursework and conceptual plans to capture stormwater in Proctor Creek watershed communities. Park Pride, one of ECO-Action’s partners, laid the foundation for this work in their Proctor North Avenue Green Infrastructure Vision Plan. In 2017, ECO-Action was an active participant in the Conservation Fund’s EPA Urban Waters Small Grant project by developing community engagement around the use of green infrastructure in parks to mitigate stormwater runoff issues. ECO-Action has also been able to expand their partnerships and programming over the past year as a member of the Urban Flooding and Equity for Vulnerable Communities Collaborative. The first series of AWLN trainings began in April 2017 in which 20 members from the Proctor Creek Stewardship Council and the Intrenchment Creek Green Infrastructure Advocates participated. Residents previously involved in watershed and green infrastructure programs were paired with those who were less familiar. In this way, ECO-Action encourages community members to take ownership of the initiative creating strong self-motivated teachers and advocates for the community. During the AWLN training, participants learned about their watersheds, stormwater flooding issues and green infrastructure solutions. Members attended green infrastructure tours and community events that encouraged community participation in green space design and implementation. The training also included action projects focused on communication, education, advocacy, green infrastructure practices, equity, and water quality monitoring. The projects were designed to empower AWLN participants to apply what they learned in real-world situations to improve their environment. The first round of training culminated in August 2017 with the presentation of the action project results. Members of the AWLN are educating and empowering their community as well as sharing their initiatives with a wider audience. In cooperation with organizations and residents, the AWLN released its first newsletter featuring community voices and stories from Proctor and Intrenchment creeks. AWLN participants are also involved in the creation of an educational website in collaboration with the Odum School of Ecology at the University of Georgia. The website – entitled The Watershed Learning Network –includes learning resources for both students and teachers. It is applicable to any urban waters setting and encourages others to create their own watershed learning networks. While website development is still in process, it is already being used in the current round of AWLN training that began in April 2018. The 2018 trainings have expanded to include a third Atlanta watershed in addition to Intrenchment and Proctor Creeks. 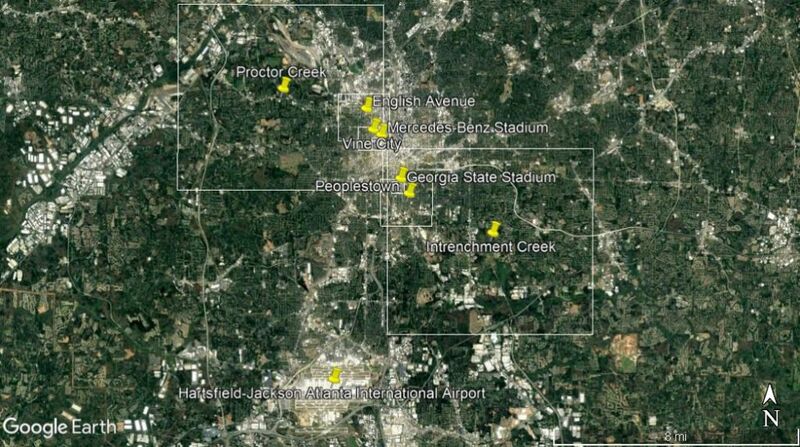 Currently, there are participants from communities in the Flint River area of south Atlanta where the headwaters are near Hartsfield-Jackson Atlanta International Airport. ECO-Action and partner organizations have developed programs that empower community members to be strong voices for equity and environmental justice in their neighborhoods. Through the development of the AWLN, residents of Atlanta’s most impacted watersheds are becoming more knowledgeable about the environmental impacts that threaten their communities. Like a ripple effect, knowledge spreads and transforms into empowerment. Equipped with tools like green infrastructure, they can advocate for equitable solutions to decrease stormwater runoff and provide green spaces that make neighborhoods healthier and more livable. Beyond Atlanta’s neighborhoods, the AWLN provides resources and materials that are helpful to urban waters practitioners around the country. In association with the Urban Flooding and Equity for Vulnerable Communities Collaborative, twelve representatives involved with the Atlanta Watershed Learning Network (AWLN) attended River Network’s May 2017 River Rally in Grand Rapids, MI. Members of the AWLN hosted a workshop entitled Equitable Urban Planning for Resilient Communities; and, members of the Proctor Creek Stewardship Council made a presentation about Leveraging Local Knowledge for Community Change. At ECO-Action, our mission is to help communities organize to confront environmental health threats, and to strengthen & facilitate participation of communities in preventing and resolving such threats.